London, Royal Academy, 1891, no. 908 London, Arthur Tooth and Son, Winter Exhibition, 1891, no. 4. Henry Blackburn, Academy Notes 1891, London, 1891, p. 22. Vern Swanson, John William Godward: The Eclipse of Classicism, Woodbridge, 1997, p. 182, no. 9, illustrated p. 41, pl. 12. 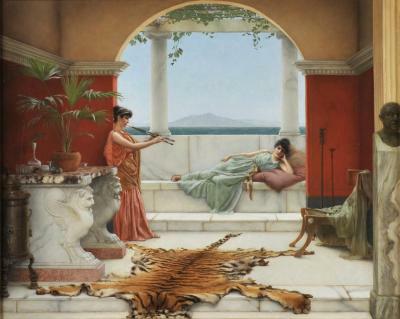 John William Godward can be considered the best of the last great European painters that embraced Roman and Greek Classical antiquity in their art. In his work we can see the final summation of half a millennium of Classical antique influence on Western Painting. With his tragic suicide in 1922, this tradition more or less disappeared with him. 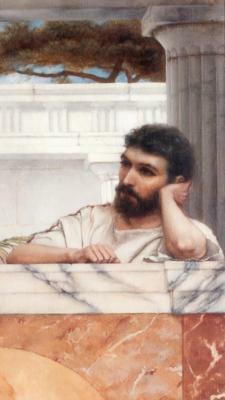 John William Godward was born into a bour . . .